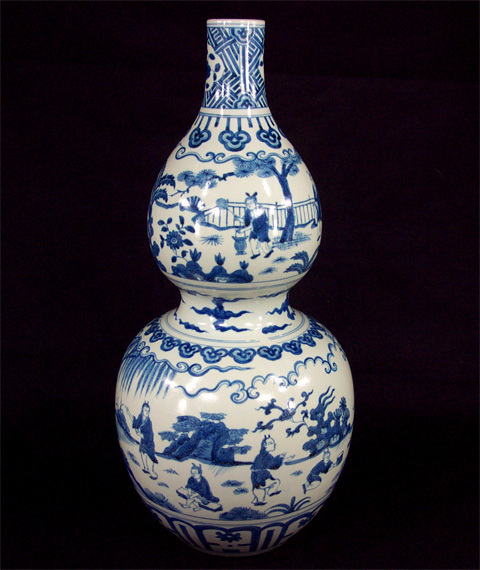 Another lovely blue and white double gourd vase also reflects the Jiajing zeitgeist. 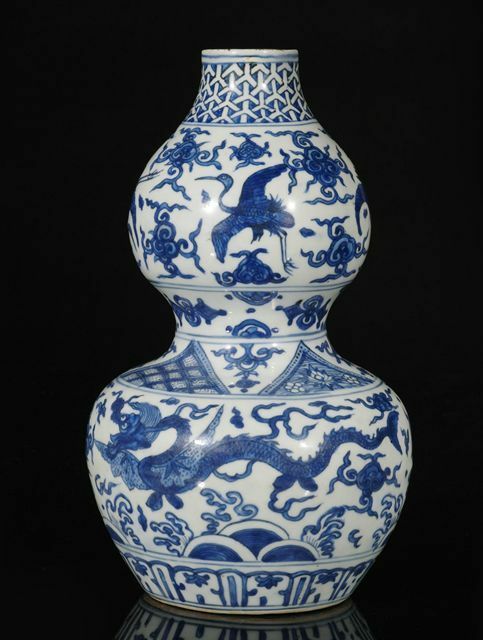 On this vase, an auspicious crane flies throught the clouds above a powerful dragon. 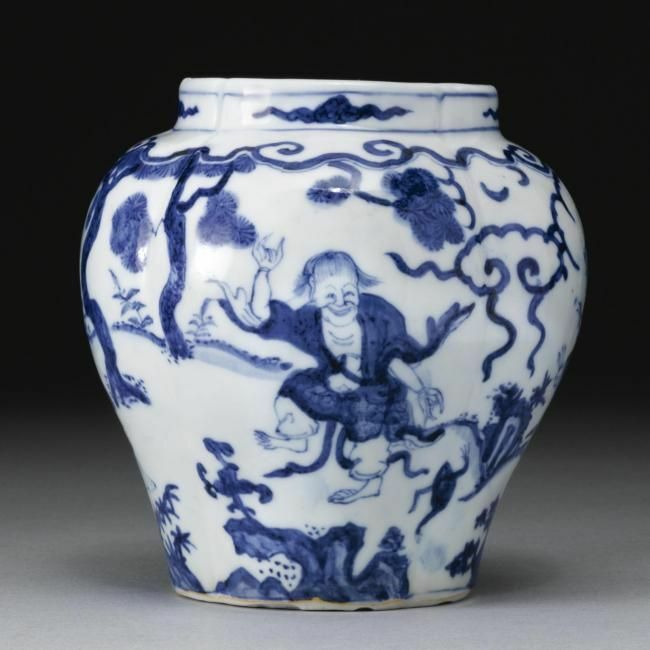 This small jar portrays the four Daoist Immortals Li Tieguai, Liu Hai, Hanshan and Shide dancing in a pine forest beneath swirling clouds. ‘Shou’ is the symbol for longevity. 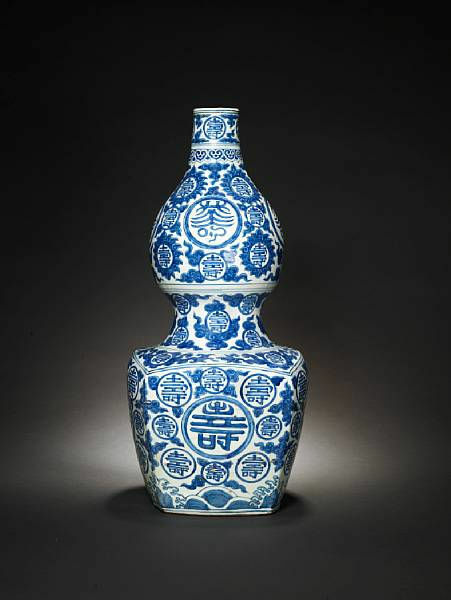 This double vase presents numerous shou medallions of various sizes embedded in a matrix of clouds and flames. The insubstantial nature of the arts and crafts of the Jiajing reign was counterpointed by all-too-real deterioration of conditions within China. Though occasionally wracked by external wars and secession crisises the early Ming dynasty had been a golden age when Chinese power and affluence reached peak levels. However as the Jiajing emperor turned his back on the world to sip mercury and contemplate the serenity of clouds, fissures started growing between the Empire’s various classes, the treasury became empty, and barbarians and client states around China perceived opportunities to exploit China’s weakness. I have quite a collection of Asian pottery too. Ooh…I love Chinese porcelain. Do you have any antique pieces?